The time has come for Los Angeles Dodgers second baseman Chase Utley to walk away from the game. 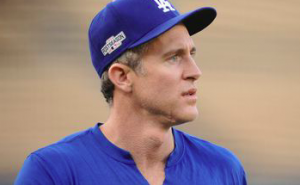 Utley announced Friday night that he plans to retire at the end of the season. The 39-year old has played 16 major league seasons. He signed a two-year deal with the Dodgers in February, indicating he was at least considering the thought of playing in 2019. Instead, he’s decided the time is right to retire after the current season. Utley broke into the big leagues in 2003 with the Philadelphia Phillies. Almost immediately, he established himself as the franchise’s long-term second baseman. Utley was a key figure on the Phillies teams that had an extended run of success in the NL East, culminating in a World Series title in 2008. Along the way, Utley was named to six all-star teams, including five straight years from 2006 to 2010. Of course, Utley has also acquitted himself since coming to the Dodgers in a trade midway through the 2015 season. He’s been more of a complementary player since moving to Los Angeles. But he’s provided valuable leadership as a part-time player while helping the Dodgers continue their streak of five consecutive NL West titles. “I’m also a part-time strength coach, a part-time pitching coach, occasionally a part-time catching coach as well as a part-time general manager,” Utley joked. In his career, Utley owns a .276 batting average, amassing over 1,800 hits, 259 home runs, and 1,025 RBIs. Rather quietly, Utley has also stolen 153 bases during his career, getting caught only 22 times. His career numbers should warrant at least some consideration for the Hall of Fame. Alas, father time appears to have finally caught up with Utley this season. He’s hitting just .231 with an OPS of .644 this year. After hitting 14 home runs in 2016 and eight home runs last year, Utley has just one long ball in 2018. Both he and Logan Forsythe have become afterthoughts at second base in favor of Max Muncy, who has come out of nowhere to have a breakout season. Of course, there’s still time for Utley to win a championship. The Dodgers have recovered from their slow start and are now neck and neck with the Diamondbacks atop the NL West. The rest of the National League remains wide open, so the pennant is there for the taking. Utley is yet to make much of an impact for the Dodgers this year. But it’d be foolish to rule out the possibility of him doing something significant to help the Dodgers pursue a championship before the season and his career come to an end.